WASHINGTON—Eyes widening in terror as she scrolled through the day’s images, chief official White House photographer Shealah Craighead became increasingly disturbed Thursday after discovering a faint, ghostly image of Melania Trump in the background of every photo she had taken. “I swear the State Dining Room was completely empty when I shot these. 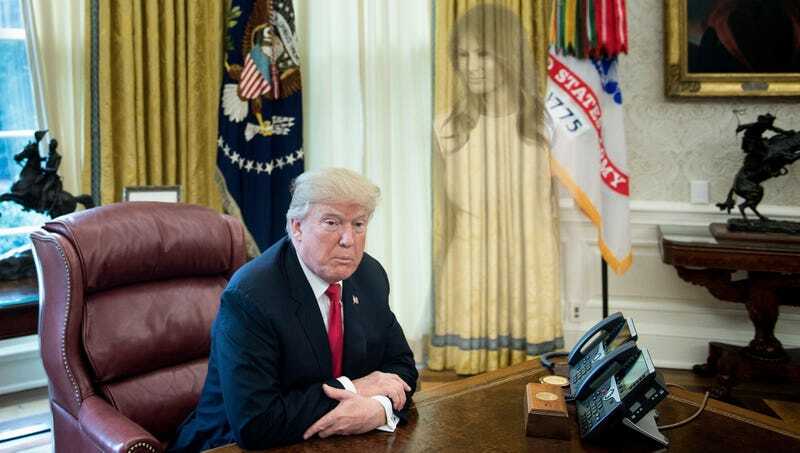 Oh, my God, there she is again,” said Craighead, visibly shaken by the apparition of the first lady lingering in the back of the Roosevelt Room, her face strangely expressionless, her translucent arms reaching toward the camera. “This is really freaking me out—I haven’t seen her in weeks, let alone photographed her, and yet she’s in every single one of these pictures. I definitely would have noticed if she’d been sobbing in the corner during today’s full cabinet meeting.” Craighead added that after analyzing the photos, she discovered that Mrs. Trump’s shade seemed to assume a more solid form the closer she was to the site of the mysterious sinkhole that recently appeared on the White House’s North Lawn.